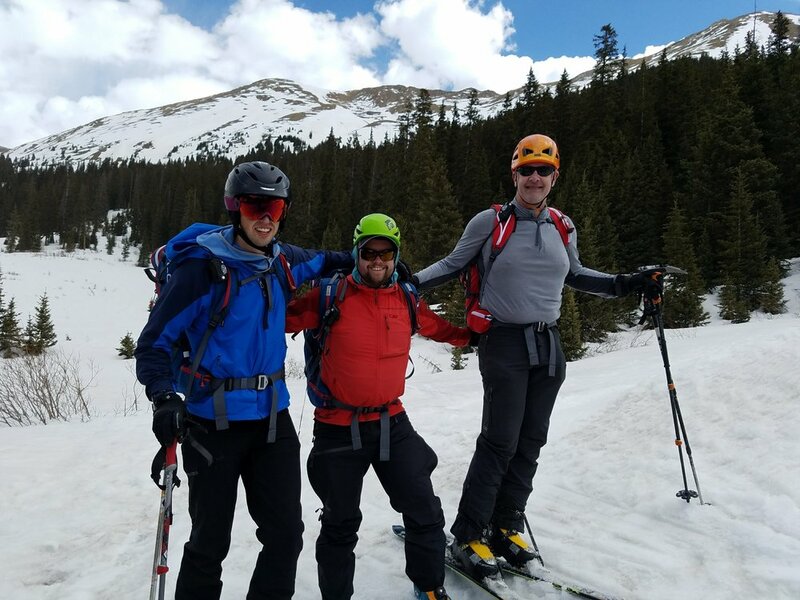 From April 27th to May 1st, Owen, Dad and I went to Colorado for some springtime backcountry skiing. Conditions this time of year are always a gamble, and we flew out without any solid plans. Conditions turned out to be great, though, and we got the opportunity to ski several lines which had been on my tick list for years. We decided to spend our first day acclimating by skiing at Arapaho Basin Ski Area. 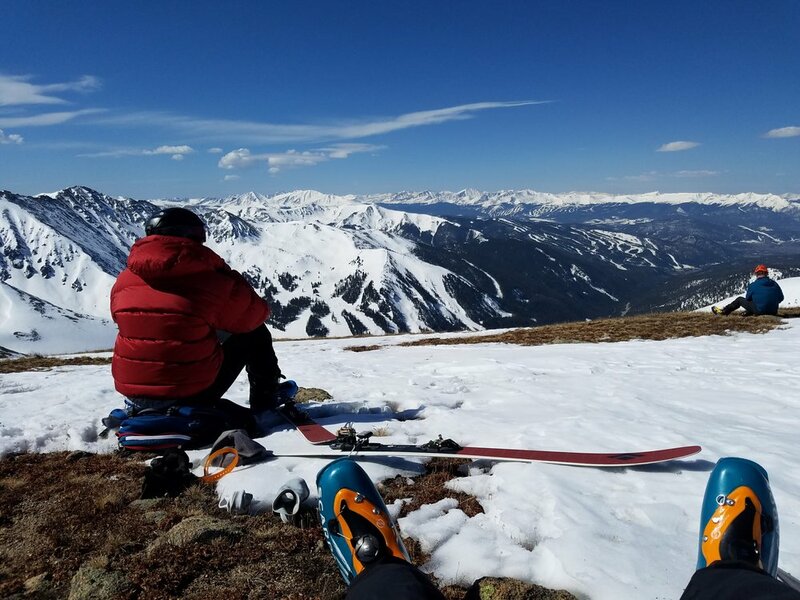 This was good for us because we got to scout conditions of lines off nearby Loveland Pass, as well as get an idea of the timing of the snow. This time of year, the snow on most aspects freezes hard during the night and gradually softens during the day until it turns into a sloppy, bottomless mess. 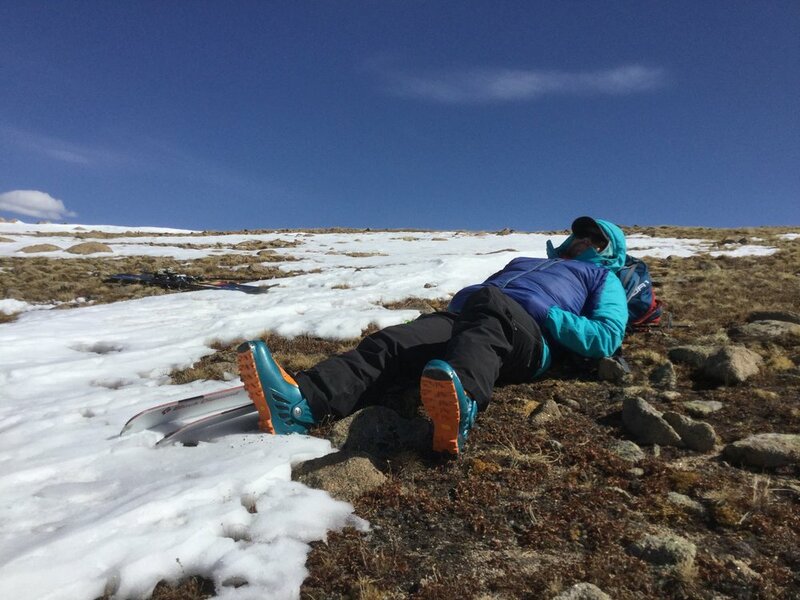 The trick to springtime ski mountaineering is to time your descent for when the snow softness is just right. Arapaho Basin also is at high elevation: between 10,500 and 12,500' so it's good for acclimating. 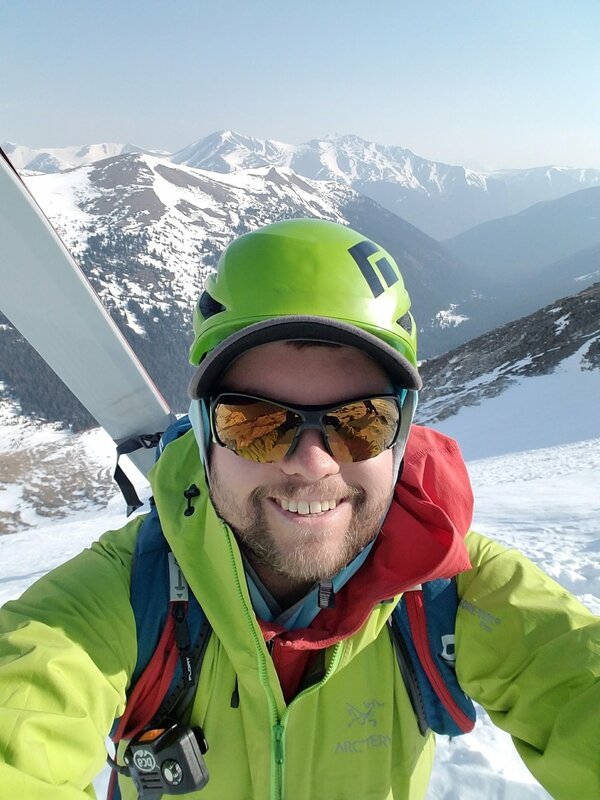 We also had the pleasure of accessing some of the hike-only terrain on the Northeast Face above the main ski area, which I've had my eye on for a long time. The next day we hiked from Loveland Pass (11,990') along the Continental Divide to the summit of "Cupid", a 13,117' bump on the ridge between Mt Sniktau (which Matt and I skied two years ago), and Grizzly Peak. We were aiming for an attractive line called Dave's Wave, so called because it follows a prominent cornice which appears like a crashing wave from some angles. 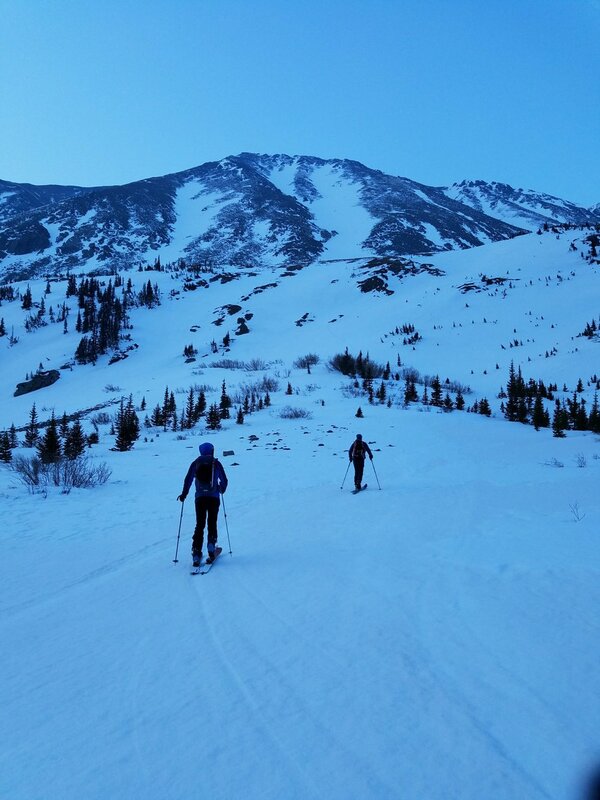 Dave's Wave is a classic Summit County ski descent, because it has a reasonable angle, reasonable approach, and it holds snow reasonably late in the year. We managed to time this ski descent perfectly, with all 2200' in prime condition. Some of the snow lower down was heavenly. Dave's Wave (in red) taken from the summit of A-Basin ski area. We had a beautiful hike to the summit of Cupid, where we got great views of our potential line Tuning Fork, a massive 3200' couloir on the Northwest face of Torrey's Peak (14,275'). We also met a fellow skier named Bill and his rockstar mountain dog named Buddy. We sat at the top of the line for about a half hour before deciding it was good to ski. Hiking along the continental divide. 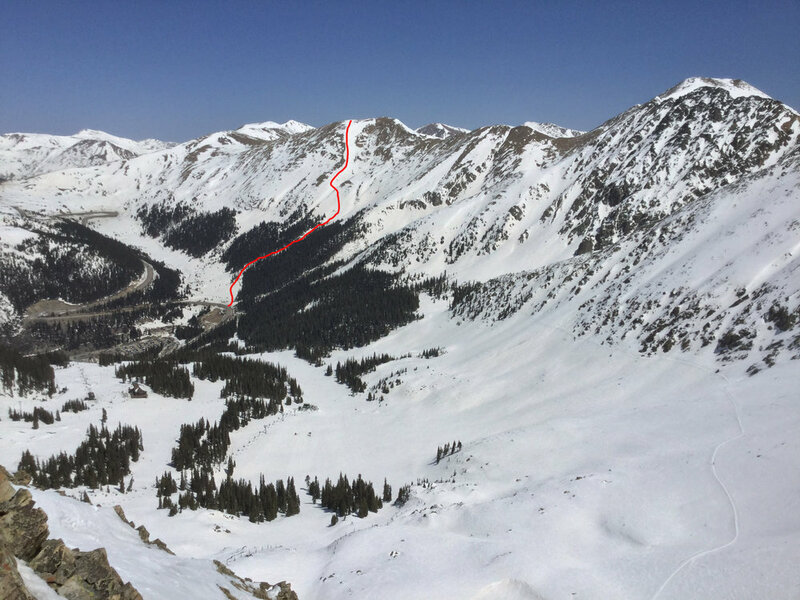 Cupid (13,117') is the rounded bump ahead of us, and Torrey's Peak (14,257') is the tall mountain beyond, left of center. The upper tines of Tuning Fork are visible coming off Torrey's summit ridge, just to the right of the hiker (Dad). On the 29th, Paul Kaster and his faithful canine companion drove up from CO Springs to join us. Having seen Tuning Fork the day before, we thought we might do something a little more mellow this day in order to conserve energy and make a go for it on the 30th. We heard from Bill on Dave's Wave that Grizzly Bowl was a good ski when conditions were right. 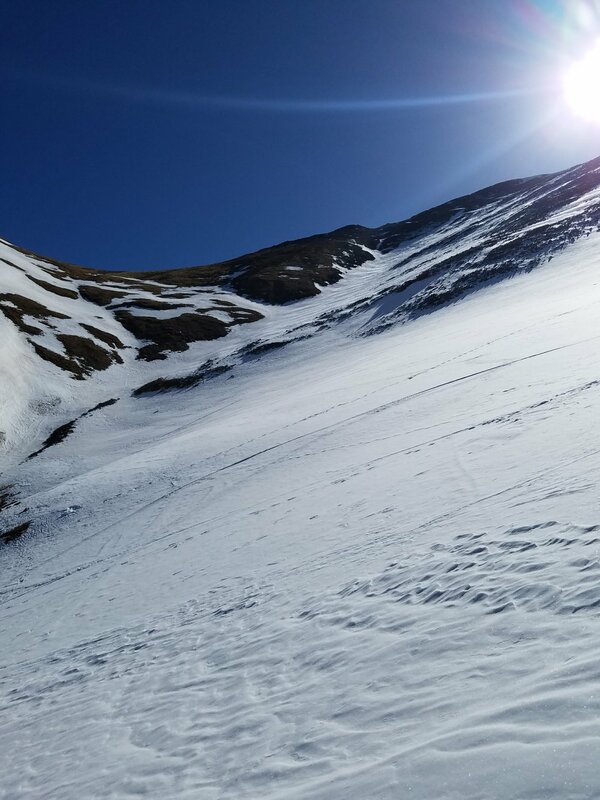 Problem is, Grizzly Bowl is an avalanche death trap, so it's rarely safe to ski. Lucky for us, it was safe on Sunday. Unlike Dave's Wave, we didn't time the snow transition very well. It was crusty and icy near the top, and soft mush on the exit. Nevertheless, fun was had. We were also treated to the most well-behaved mountain (and unbearably cute, in her ski goggles) dog I've ever had the pleasure of playing with. I guess all those years Paul spent in the Air Force paid off. On Monday, we felt the weather, snow conditions, and personal acclimation had aligned enough to attempt a line I've been after for years. Tuning Fork on Torrey's Peak is actually one of the lines that inspired me to buy my first pair of backcountry skis six years ago. It's huge, it's aesthetic, and it's glorious. It also is one of the longest continuous ski runs in CO, running for a length of 3200' from roughly 13,900' to 11,700'. Besides the mountaineering challenges presented by a 3000' steep snow couloir on a 14,000' peak, Tuning Fork has two main ski chalenges. First, it's long and spans a wide elevation (and therefore temperature) range. Unless you're really lucky (or really fast) it's nearly impossible to ski the entire thing in good condition. The other challenge is stamina. 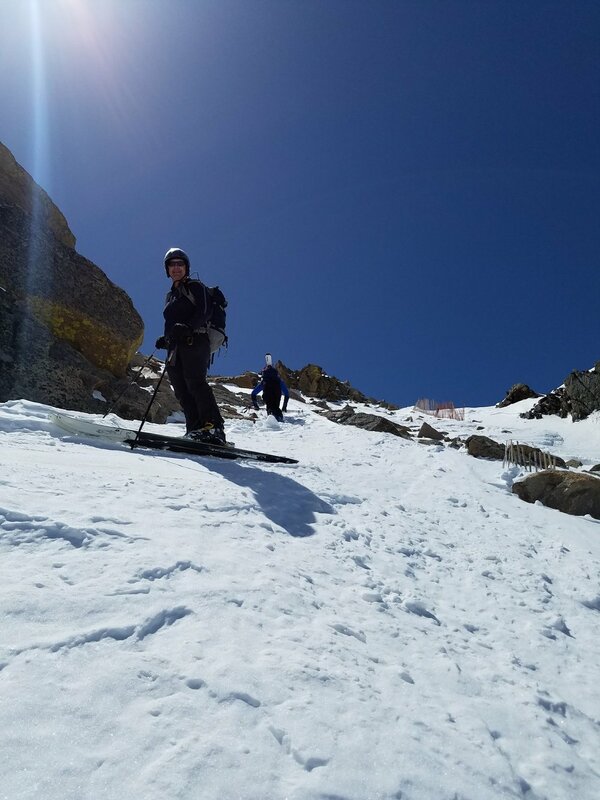 You've got to ski 3200' of steeps after having skinned in three miles up Grizzly Gulch and then climbed your way up the couloir. It is a worthy objective for any ski mountaineer. We left the house in Dillon at 3:00am and were on our way up Grizzly Gulch by 3:50am. The snow in the gulch was such that we had to park at 10,450' at the fork between the Grizzly Gulch and Steven's Gulch roads. We made decent time hiking and skinning up the Grizzly Gulch road until the turn off for Tuning Fork at 11,200'. 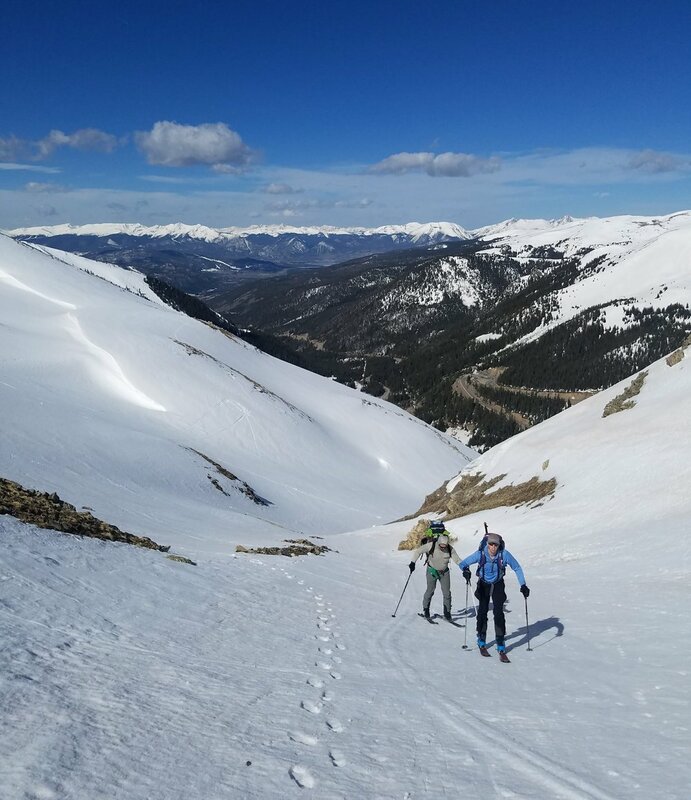 We switched to crampons and started climbing the couloir proper about 12,000'. At first, we had a delicious boot pack left by skiers a few days prior. Unfortunately, that bootpack filled in with blowing snow as we got higher, and we were forced to kick steps the rest of the way. Thankfully, Owen is a step kicking machine. After his warm up on Rainier last summer, he was ready to go and kicked nearly 2000' of steps for Dad and I. Without him, this wouldn't have happened. We reached the top of the Tuning Fork about 12:30pm. I've climbed Torrey's at least twice, and who knows how many times Dad has summitted. Owen however, had never been above 14,000' (we had to turn around at 13k on Rainier last summer). In order to give us some time to rest before the ski descent, Dad and I stayed at the top of Tuning Fork while Owen went the last 300' to the summit. 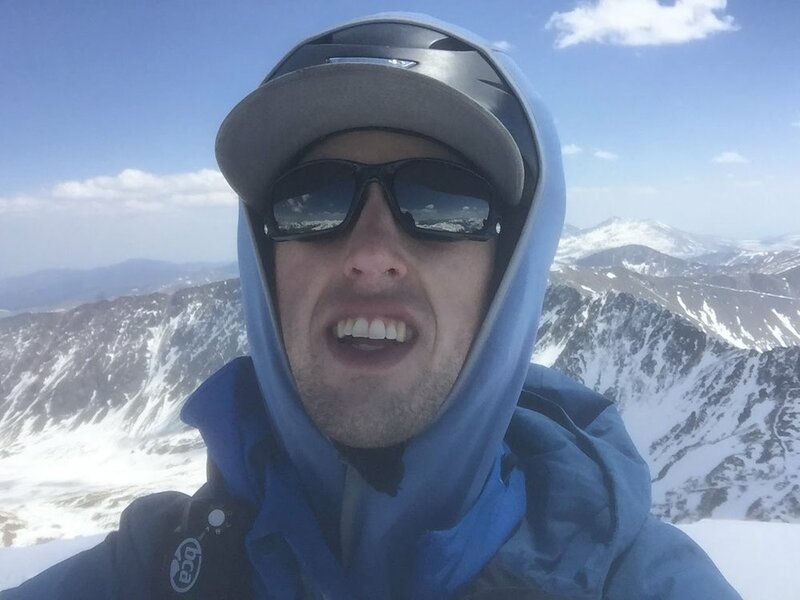 Not bad for a first 14er! The ski descent delivered on its promises. We had 3200 feet of skiing, some of it good and some of it tough. We had a surprisingly winter-like snowpack at the top of the run, and the sun hadn't quite warmed the snow in the middle perfectly. Still skiable, and still epic. The lower part of the run was as pure corn as you'll find during the Harvest Moon.